The chatter at Penn State continues to circulate around Joe Paterno, who is entering the final year of his contract and, perhaps, his final season as coach. The latest round of speculation started Monday when the site Lasch Out reported that former Pittsburgh Steeler coach Bill Cowher had been on campus Feb. 24-25, which included an overnight stay at the house of Nittany Lion athletic director Tim Curley. That sent the Internet sleuths into motion and Lasch Out followed with a report that Cowher's home in Raleigh was on the market, with the implication being that Cowher was possibly in line to become Paterno's successor. 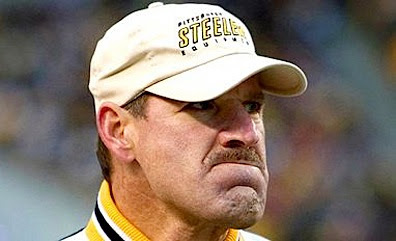 But when contacted Tuesday by Ed Bouchette of the Pittsburgh Post-Gazette, Cowher laughed, saying, "I'm not going anywhere." He added: "Put that to rest. I'm staying here." As for Paterno's future, it remains in question. A column last week by David Jones of the Patriot-News mentioned the possibility of Penn State defensive coordinator Tom Bradley eventually taking over for Paterno, who has fallen out of favor with university president Graham Spanier and key trustees. As the story goes, university power brokers have grown tired of embarrassing incidents involving Paterno (road rage, for example) and continuing issues with his players getting in trouble. "Where can Paterno give ground? It's clear. Name your retirement date now, Joe. "I'll bet Spanier would give Paterno one more year through 2009 just to reach closure on this mess. But, agree to 2008 as the last season and you really get some 'security for your assistants.' ... Paterno could make this his stipulation: Bradley is named the associate head coach and takes over in 2009." What is clear is this: Until Paterno's contract situation is addressed, the speculation about his future will continue. Paterno's retirement date is x number of wins after Bobby Bowden retires. Of course Bobby's retirement date doesn't come until after Paterno retires. So far everyone has been betting on nature settling the matter, but those two are tough hombres.